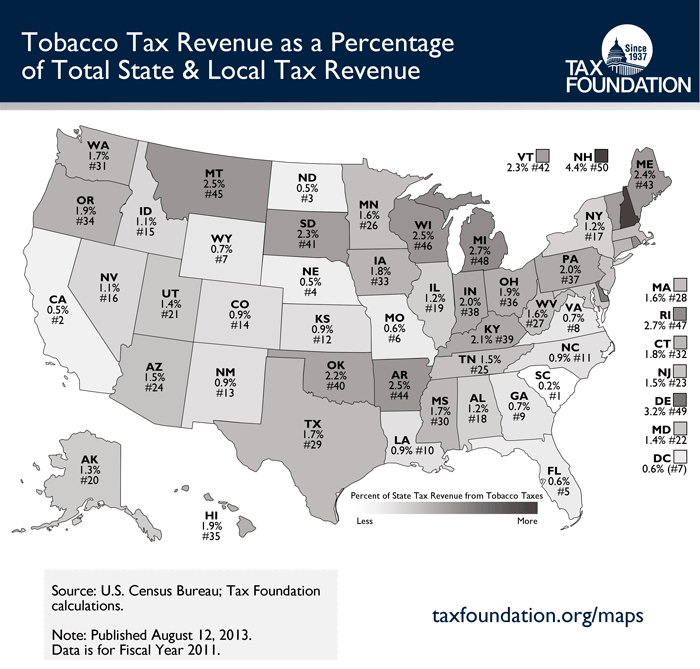 The fifty shades of tobacco taxes: this week’s Monday Map takes a look at how heavily state and local governments rely on revenue from tobacco taxes. New Hampshire takes the lead, gaining over $232 million in revenue from taxes collected on tobacco products, which equates to 4.37 percent of its total tax revenue. The "Live Free or Die" state has a fairly competitive cigarette tax rate compared to its neighbors, so one reason that such a high percentage of its tax revenue comes from tobacco sales might stem from the well documented phenomena of cigarette smuggling and/or cross-border shopping. Raking in more than $128 million in tobacco tax revenues (3.17 percent of its total tax revenue), Delaware is the only other state that breaches the 3 percent mark. On the other end of the spectrum, South Carolina comes in with the lowest percentage at 0.18 percent, and California comes next at 0.49 percent.